This is a first time initiative of Jamiyah during Hari Raya Aidilfitri other than its annual distribution of meat during Hari Raya Aidiladha, meant for the less privileged. The first day of distribution on 20th June was at Whampoa Community Centre, followed by Jamiyah Headquarters and Marsiling Community Centre the next day. 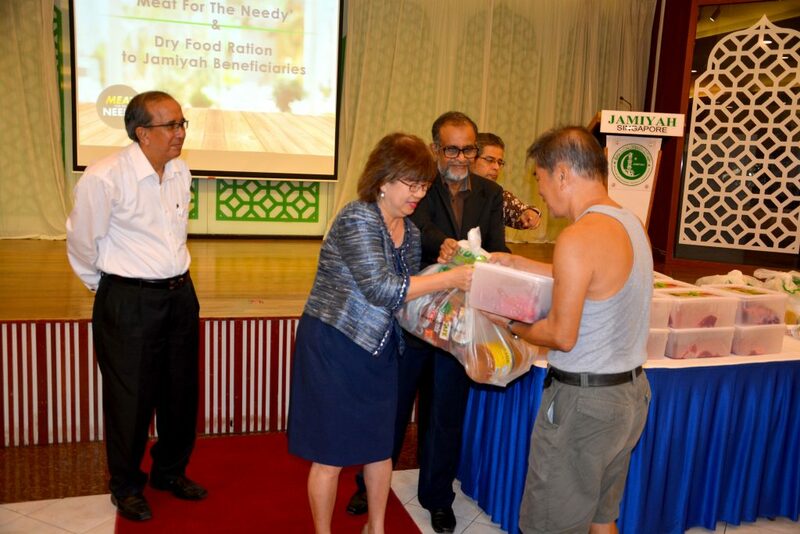 Jamiyah had the honour of having Ms Denise Phua, Mayor, Central Singapore CDC, at the distribution for beneficiaries at Jamiyah Headquarters, and Mdm Halimah Yacob, Speaker of Parliament at Marsiling CC, as Guest-of-Honour. This Saturday, beneficiaries from Chua Chu Kang will be receiving the meat for the festive season.